Last year I was contacted by the Journal of Futures Studies with an invitation to contribute an essay in their special issue on the Communication of Foresight, a complication focused on the new communication and media strategies people are using to engage people in thinking and acting about the future. At that time, we were in the midst of producing the Future of Facebook video series, a pilot project for the Open Foresight methodology being developed in collaboration with professional futurist John Smart and forward-focused colleague Alvis Brigis. 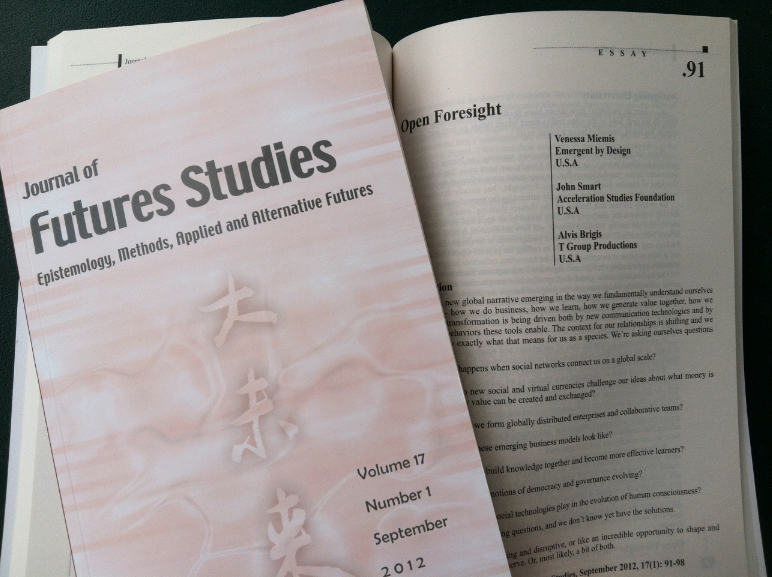 The three of us worked on the following article, which describes our process and project, and just appeared in the new Journal of Futures Studies! Super exciting to see the work published, and I hope it means more projects like it will be created so we can continue to elevate visionary thinking and the quality of public discourse. There’s a new global narrative emerging in the way we fundamentally understand ourselves as humanity – how we do business, how we learn, how we generate value together, how we interact. This transformation is being driven both by new communication technologies and by the emergent behaviors these tools enable. The context for our relationships is shifting and we still don’t know exactly what that means for us as a species. What happens when social networks connect us on a global scale? How do new social and virtual currencies challenge our ideas about what money is and how value can be created and exchanged? How can we form globally distributed enterprises and collaborative teams? What do these emerging business models look like? How do we build knowledge together and become more effective learners? How are our notions of democracy and governance evolving? What role do social technologies play in the evolution of human consciousness? These are all challenging questions, and we don’t know yet have the solutions. That may sound terrifying and disruptive, or like an incredible opportunity to shape and bring about the future we deserve. Or, most likely, a bit of both.